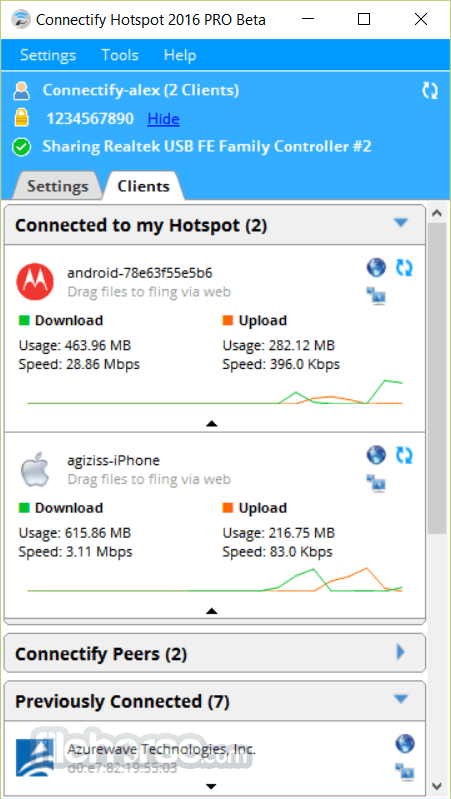 Connectify Hotspot is a software router for your Windows PC or laptop. With Connectify Hotspot, you can transform your PC into a real WiFi hotspot, and share your computer’s Internet connection as Wi-Fi with any other PC or mobile device. Just give your Hotspot a name and password, and you’re ready to go. Connectify Hotspot isn’t just the world’s most powerful hotspot software, it’s the easiest, too. Just give your Hotspot a name and password, and you’re ready to go. Connectify Hotspot lets you easily turn your PC into a Wi-Fi Hotspot so you can share Internet with all your devices. Turn a wired connection into WiFi at the click-of-a-button and even share an existing wireless network as Wi-Fi. Your Hotspot is automatically secured with WPA2-PSK encryption, just like a conventional router. That means, all users get the safest and most secure WiFi sharing experience available. Finally! You can track down that friend who’s using all your bandwidth. Newest feature gives you real-time graphs for monitoring how much data your various connected client devices are using at a glance. Forget passing around USB thumb drives. You don’t know where those things have been. Germ-riddled USB drives b’gone. Connectify Hotspot is the only software router that lets you wirelessly send files directly to connected devices, without even needing an Internet connection. In an ideal world we’d be able to pass EVERYTHING this way, but for now just files. Get PRO or MAX to unlock unlimited file flings. Note: 2 (two) days trial version. Requires .NET Framework. Limited functionality.